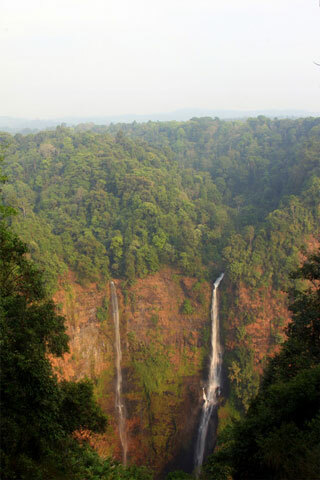 Tad Fane is considered one of the top waterfalls to visit in the Bolaven Plateau and is certainly one of the more easily accessed. Browse places to stay in Pakse on Agoda.com. Free cancellation. Given the height of the twin cascades—a river plunges 120 metres off a cliff surrounded by the dramatic jungles of Dong Hua Sao NPA—this is a crowd pleasing site. Tad Fane (also spelled Tad Fan) is viewed at a distance from across the gorge and for most visitors, it’s some quick photos, gawking and a coffee at the nearby Tad Fane Resort before moving on. Visitors face east, so lighting for photos is best after midday with the sun behind you (and shining into the chasm) to better illuminate the falls. If you’re unlucky, fog can completely hide the waterfalls. Green Discovery in Pakse does trekking into Dong Hua Sao NPA, including a strenuous trek to the top of Tad Fane. Mr Koffie sometimes runs his tours from Tad Fane Resort—advanced booking is required. The turn off for Tad Fane is located 38 km from Pakse, 12 km from Paksong. Browse our independent reviews of places to stay in and around Pakse. Read up on where to eat on Pakse. Check out our listings of things to do in and around Pakse. Read up on how to get to Pakse. Planning on riding a scooter in Pakse? Please read this. See below for more sights and activities in Pakse that are listed on Travelfish.org.